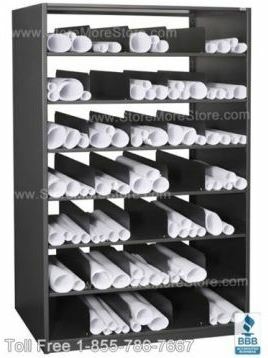 The Rolled Document Shelving has multiple adjustable partitioned storage openings where documents and plan drawings can be categorized and stored safely, so they won’t get crushed or damaged. 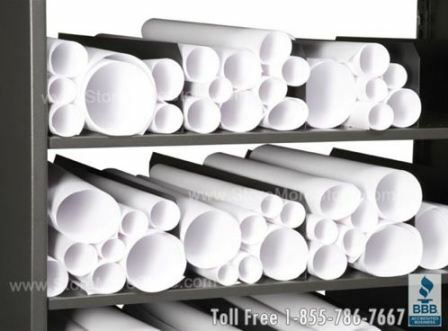 Also, our Rolled Document Shelving will maximize the number of documents, blueprints, plan drawings, and oversized papers you can store in a designated area. Rolled Document Shelving saves space because everything is organized and stored on vertical shelf levels instead of stacked flat. 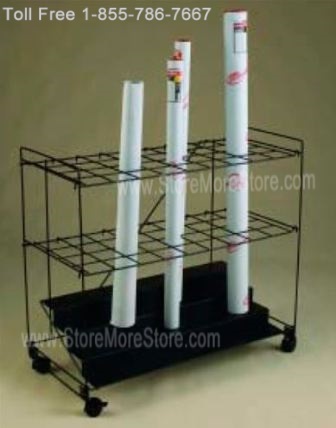 The shelving not only increases your storage capacity, but it will protect drawings from water, dirt, and rodents that can damaged your important papers. If you are working on several drawings and need to put them away or give them to a coworker, it can be a pain to carry them all while they are rolled up. Fortunately our Rolled Plan Drawing Carts make transporting rolled documents and rolled plan drawings easy. Our Rolled Plan Drawing Carts are available with either 36 openings or 60 openings to match your needs. You can buy both Rolled Document Shelving and Rolled Plan Drawing Carts online at StoreMoreStore. Our goal is to provide solutions that will make storage in your office easy and efficient, so if you have any questions or need any help please give us a call at 1-855-786-7667.